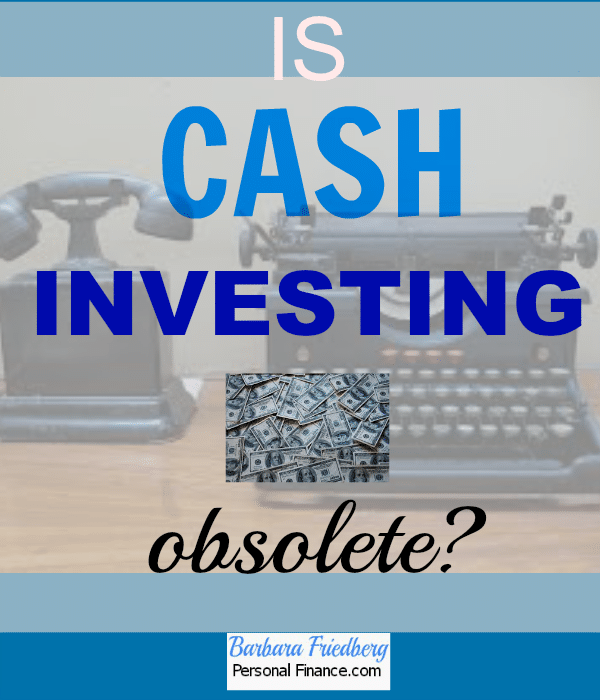 Is Cash Investing an Obsolete? A typical portfolio includes stock financial assets, bond type assets, and pinch of cash in its asset allocation. In fact, Schwab Intelligent Advisor’s new robo platform includes a reasonable allocation to cash. I’ll admit that I’m old school and getting more conservative with age, and I like cash. There’s something nice with knowing that you have some cash in your portfolio. I know, the cash investing returns are paltry. Interest rates are near zero. Heck, cash’s competitors T bills, TIPs, and I Bonds are yielding next to nothing. And the past few years, the stock market is going gangbusters. So why tout the benefits of cash? Psychologically, it gives you comfort that if the market goes south (and it always does); the cash in your portfolio will stabilize your total net worth. You don’t have to worry that your cash will suddenly fall in value, like your stock or bond assets. There’s more to investing than rate of return, what about capital preservation? Investors have short memories. When I was younger, interest rates were high and so were CD and money market rates. (Granted, inflation was higher too). Click here if you’d like a wealth building plan. Real return is the actual increase in value of your assets after subtracting inflation and taxes. Real return is usually around 3% or so on stock investments, a bit less on bonds, and still less on cash. But what about the year the stock market drops 10% and there’s 3% inflation? That’s a negative 13% real return on your stock assets. And during that same year, cash will shore up your capital. Don’t think a down year won’t be coming in stock or bond returns. Business cycles and market returns are cyclical. Inflation may tic upward as well. The historical inflation rate is about 3% and inflation is now below 2%, the Fed’s current inflation target. All I’m suggesting is, cash has a place in your investment portfolio, just like stock and bond investments. It’s a good idea to check out economic history. There’s no guarantee it’ll repeat, but there’s also no guarantee that the present will continue into the future. Keep yourself covered and diversify your assets. Don’t get lulled into a belief that stock market returns will continue in the high double digits or that inflation will continue near zero. Consider the possibility that the economic future will change and that cash might be your friend in the future. Is cash investing obsolete? I don’t think so.